I have been trying to setup my test server the past couple of hours but have run in to a problem i really can't seem to fix. Installed xampp, heidi sql and imported the sql script that comes with the server files. Works like a charm, no errors what so ever. ;; This is for VAC Protocol for VAC Bans + Steam Friends. ;; This feature requires Steam + Rcon to be enabled. ; idleTime no Default Value yet, needs to be defined. ; 	idleTime is the time before a database session is stopped if not used. 3:26:35 "ExileServer - MySQL connection error!" 3:26:35 "ExileServer - Please have a look at @ExileServer/extDB/logs/ to find out what went wrong." 3:26:35 "ExileServer - MySQL Error: Unable to locate extDB2 extension!" 3:26:35 "ExileServer - Server will shutdown now :("
Please have a look at @ExileServer/extDB/logs/ to find out what went wrong." Post your DB-Log from this folder, please. 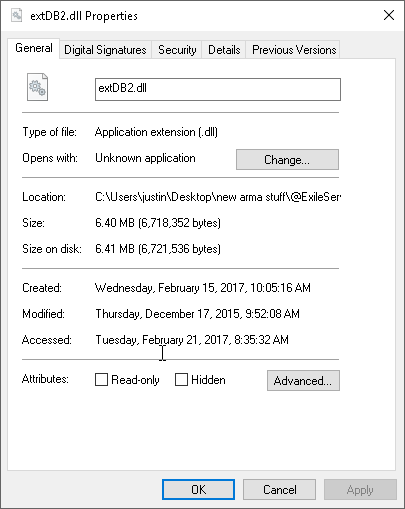 Make sure if windows you have extdb2.dll in @exileserver folder and it's unblocked. If linux then extdb2.so should be in the folder. If you have the file and not blocked. Download server files again. There's no such folder so i can't provide that unfortunately. I have redownloaded and reinstalled the server several times. Have even tried to unpack the zip files whit different programs just to make sure i'm not getting corrupted files. 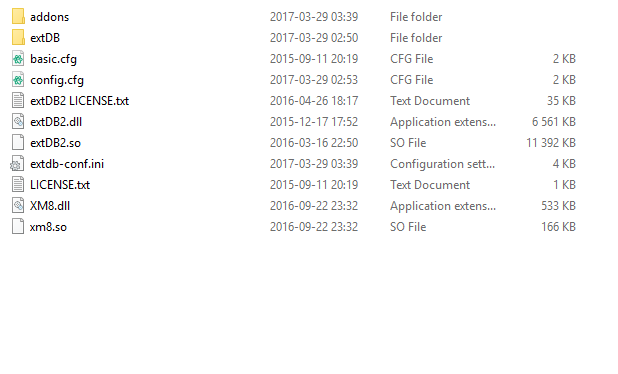 does your folder structure look like this? what does your commandline look like? 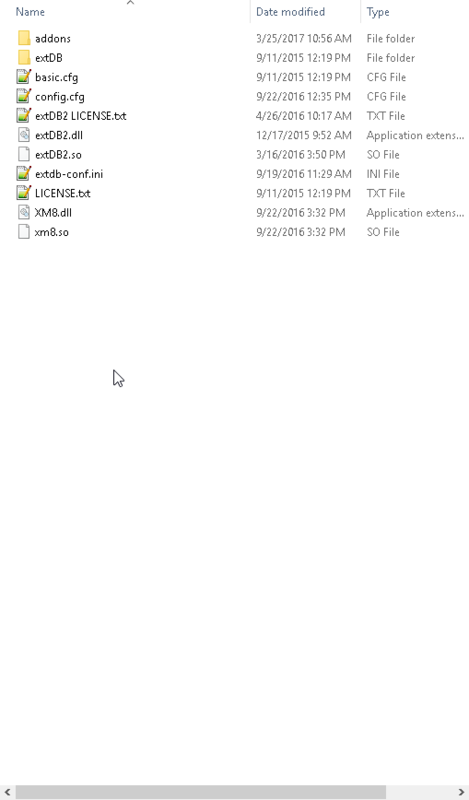 if you right click extdb2.dll is the file being blocked? That's my folder. Might be an issue whit read-only files indeed! The extDB2.dll had read-only rights and so did several other files, fixing that and will report back. if you drag files from a zip or rar file into a folder instead of right clicking and extract to... then you will get these kinds of errors. I always extract and then move the folders to their places so something else f-ed up this time. Didn't solve my issue, extDB2 still not being loaded. Back to redoing the install steps again. Solved the problem. Apparently i only installed the x64 version of https://www.microsoft.com/en-us/download/details.aspx?id=48145 and as soon as i installed the x86 version it worked like a charm!